由左、右大脑半球构成，连接两半球的是胼胝体。 By the left and right hemispheres of the brain structure, connecting the two hemispheres of the corpus callosum. 每侧大脑半球可分为上外侧面、内侧面和下面三个面。 Each side of the hemisphere can be divided into the outer side, the inner side and three surface below. 中央沟、外侧沟、顶枕沟。 Central sulcus, lateral ditch, ditch pillow top. 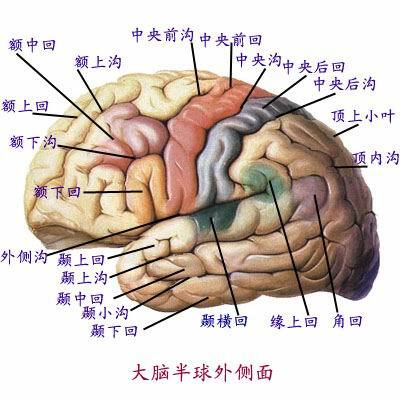 额叶、顶叶、枕叶、颞叶、岛叶。 Frontal lobe, parietal lobe, occipital lobe, temporal lobe, insula. (1)额叶：中央前沟、额上沟、额下沟、中央前回、额上回、额中回、额下回。 (1) frontal lobe: the central sulcus, the amount of the ditch, inferior frontal sulcus, medial frontal gyrus, superior frontal gyrus, middle frontal gyrus, inferior frontal gyrus. (2)顶叶：中央后沟、中央后回、角回、缘上回等。 (2) parietal lobe: the central sulcus, after the central gyrus, angular gyrus, on the edge of the back and so on. (3)颞叶：颞上沟、颞下沟、颞上回、颞中回、颞下回、颞横回等。 (3) the temporal lobe: the superior temporal sulcus, inferior temporal sulcus, the superior temporal gyrus, middle temporal gyrus, inferior temporal gyrus, temporal cross back and so on. (4)内侧面：扣带沟、距状沟、侧副沟、扣带回、中央旁小叶、海马旁回等。 (4) inner side: cingulate sulcus, from the sulcus, lateral collateral sulcus, cingulate gyrus, paracentral lobule, parahippocampal gyrus and so on. (5)下面：嗅球、嗅束等。 (5) the following: the olfactory bulb, olfactory tract and so on. (1)躯体感觉区：中央后回和中央旁小叶后部。 (1) somatosensory area: central and paracentral lobule after returning to the rear. (2)躯体运动区：中央前回和中央旁小叶前部。 (2) motor areas: central gyrus and paracentral lobule the front. (3)视区：距状沟两侧皮质。 (3) viewing area: calcarine cortex on both sides. (4)听区：颞横回。 (4) listening area: temporal cross back. 1)听觉语言中枢：缘上回。 1) hearing and speech center: gyrus. 2)视觉语言中枢：角回。 2) visual language center: angular gyrus. 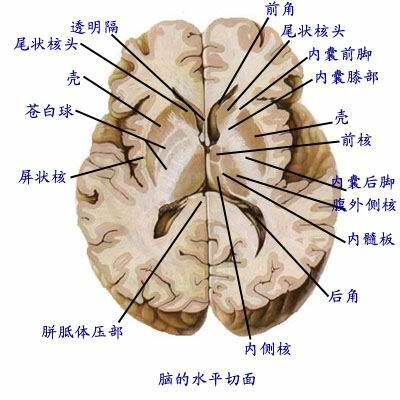 3)书写中枢：额中回后部。 3) Writing Center: frontal gyrus. 4)运动性语言中枢：额下回后部。 4) Eloquent cortex: Broca. 是包埋于大脑髓质中的灰质团块，位于大脑基底部。 Is embedded in the brain's gray matter clumps medulla, located at the base of the brain. 主要包括屏状核、尾状核、豆状核、杏仁体等。 Including screen-like nucleus, caudate nucleus, putamen, amygdala and so on. 纹状体：尾状核、豆状核合称纹状体。 Striatum: the caudate nucleus, putamen collectively known as the striatum. 主要功能是维持骨骼肌的张力，协调肌群运动。 The main function is to maintain skeletal muscle tension, coordinated muscle movement. (1)联络纤维：连结同侧大脑半球。 (1) Contact Fiber: Link ipsilateral hemisphere. (2)连合纤维：即胼胝体。 (2) Link fiber: the corpus callosum. 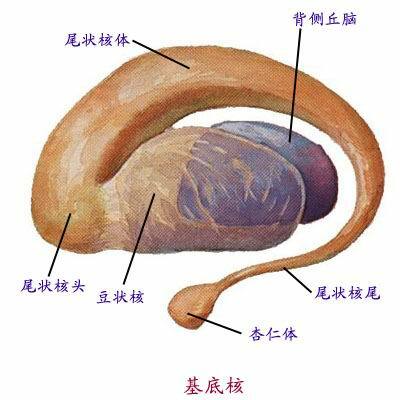 (3)投射纤维：主要是内囊。 (3) projection fibers: mainly the internal capsule. 内囊：位于背侧丘脑、尾状核、豆状核之间，由上行的感觉纤维和下行的运动纤维构成。 Internal capsule: Located between the dorsal thalamus, caudate nucleus, putamen, sensory fibers from the upstream and downstream movement of fibers. 在脑的水平切面上呈“＞＜”状，分为内囊前肢、内囊膝、内囊后肢三部。 Was in the horizontal section of the brain "> <" shape, divided into anterior limb, knee internal capsule, internal capsule three hind legs. 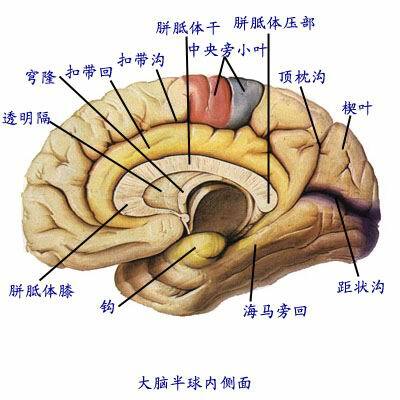 1)内囊前肢：位于背侧丘脑与尾状核头部之间。 1) in the anterior limb: Located between the dorsal thalamus and caudate nucleus. 2)内囊后肢：位于背侧丘脑与豆状核之间。 2) limb of the internal capsule: Located between the dorsal thalamus and putamen. 主要有皮质脊髓束、脊髓丘脑束、视辐射等纤维束通过。 There are corticospinal tract, spinothalamic tract, such as fiber optic radiation beam passes. 3)内囊膝：位于内囊前肢和内囊后肢交汇处，有皮质核束通过。 3) internal capsule knee: Located within the internal capsule anterior limb and hind Interchange, cortical nuclear beam through. 一侧内囊受损，可致对侧肢体深浅感觉丧失、骨骼肌瘫痪等症状。 Damaged inner side of the bag, can be caused by the depth of feeling the contralateral limb loss, skeletal muscle paralysis and other symptoms.